Good Original Condition; wear due to age such as tarnish. Bohemian rock crystal and bronze wall sconces, a pair. Each wired for the U.S. and uses 2 max. 40 watts light bulbs. 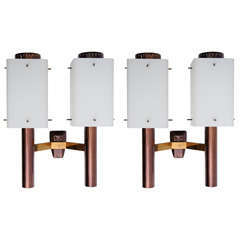 Rare brass wall sconces from Stilnovo with square opaline shades. Minor blemish on the backside of the shade, uses 1 bul each, 60W max. Wrought iron three-light applique, wall sconce from Italy. Wired for the U.S. prior shipping and uses each a max. 40 watts light bulb. Pair of French 1940s bronze wall sconces with three swirled cornucopia design arms. Impressive 19th century French bronze five-light wall sconce in the Rococo Revival style with reticulated leaf scrolls and grape cluster finial. Fine Left and Right Pair of French Regence gilt bronze three arm wall lights with leaf branches and acanthus cups and bobeches. 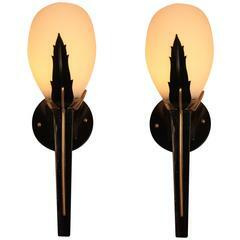 Pair of Mid-Century black lacquered iron, bronze and opal glass touchier wall sconces. Beautiful pair of carved bronze wall sconces Origin: France circa 1920 Measurements: 22" W x 14" D x 38" H.